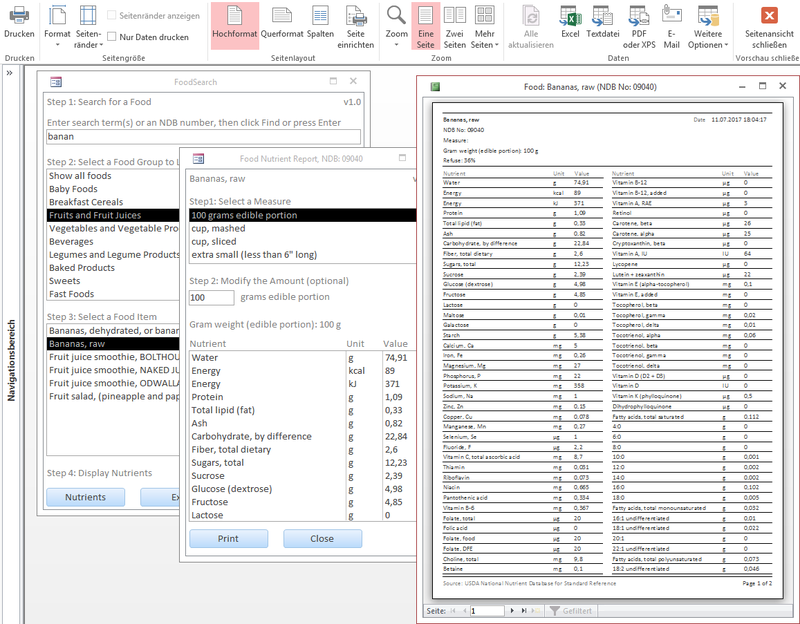 Access-Pro - USDA Food Search for Windows is back! - Was ist neu in Access 2016? 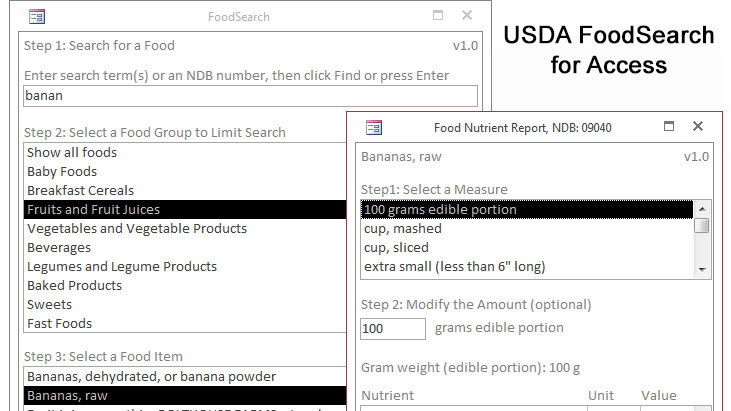 - USDA Food Search for Windows is back! USDA Food Search for Windows is back! What people don't understand is: THE DESKTOP IS NOT DEAD! Yes, people are massively surfing the internet all day and play with their fingers on touch screens in the metro or on the sofa, but still, there are some people out there working at actual desks, trying to be productive, and these people use Windows or Mac to solve real business critical problems. Browsers are nice for reading hypertext, but web applications are mostly horribly bad designs, user unfriendly, don't run offline, can't handle complex user interfaces and they are tooooooo slow. But now USDA Food Search for Deskop is back! SR18 was the last release of the USDA Food Search tool. It was end of life'd because it no longer worked reliably. Maybe the fact that an online search program was made available also had an influence to this decision. Do I use it? No! I want to work with professional desktop apps and not inside a browser. Of course I use my own apps to work with data and if you feel the same, here is your free download to get your Food Search back on your desktop. It may even work on Office for Mac 2016 (let me know if you actually try that). And since the data is delivered already in Access anyway, it makes allot of sense to build the tools in Access as well. If you have no Access installed you can download Microsoft's free Access Runtime to run any Access database on your machine for free. One thing is clear Access will handle the data VERY reiably even with 255 concurrent users. You can use this Access project for personal use and if you have already Access installed you can add some new functionality yourself or ask me to do it. If ifs no big deal I just add it to a new version of the free database. Implementing the tools in Access has one nice advantage. You can output your report to PDF and even send this PDF as email attachment to a colleague. But of course that's just a built in function from Access. You may want to add patient or client management or add a form to list the nutrients and view nutrient details to see what are the best foods of each nutrient...the sky is the limit! So here is Version 1.0 including all you may expect. Even the printing the food report is working. If the database is not running on your computer please contact me! When you press Print you get a preview window with all the great Access output options. Have fun and let me know if you want to do more with Access! Was ist neu in Access 2016? USDA Food Search for Windos is back! It's just the way you like IT. Erzählen Sie uns von Ihrem Projekt. Kontaktieren Sie uns.